Ha ha, I can bake bread. I can’t believe how successful I was and without my bread maker. The bread maker is going to find a new home in the dark basement! I am now making bread a couple of times a week. It does mean we eat it all…with butter and jam! 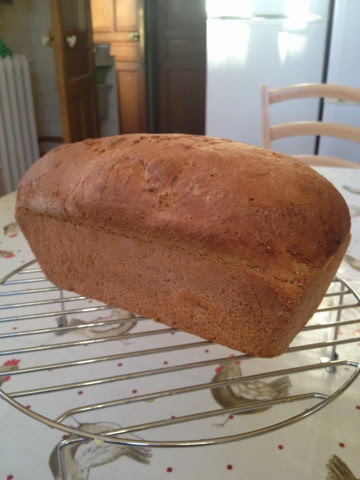 The recipe uses 500 grams of any mix of bread flour/strong flour. 7g of quick dried yeast. (I use half of a little fresh block of bakers yeast), 1 teaspoon of salt, 300ml hand hot water, 2 tablespoons olive oil, 1 tablespoon runny honey. Mix it all up or bung it in your mixer with a dough hook, kneed for 5 minutes in mixer, longer if kneeding by hand. Squash dough into a loaf tin, leave to rise covered with oiled cling film in a warm place. It takes about an hour then bung in oven at 180c for half an hour. It should sound hollow when tapped when its done, including the underneath. If its a bit squishy and not crusty underneath put it back in the oven with no tin for a few mins. When I remember where I got the recipe i will post the link! This entry was posted in Uncategorized on March 19, 2014 by louise.